I am excited to be reviewing this tobacco, and I bet you are too. 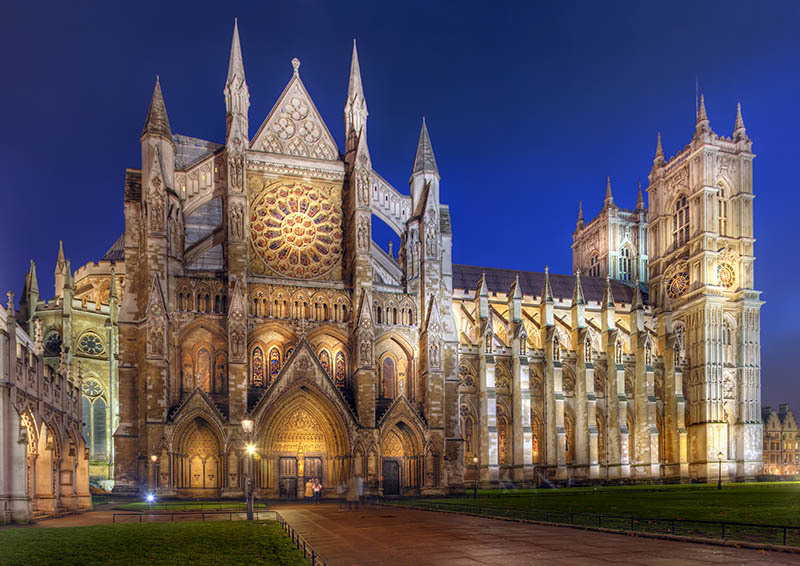 While Westminster Abbey is not one of the most common and wide-smoked tobaccos, it is one that causes a lot of strife. Some people love it more than their own dogs while some would rather give up pipe smoking than taste it once. Ok, this is obviously an exaggeration, but you get the point. What I love most about this blend is its blatant irony. As you will soon read, this blend tastes like a culmination of a weeklong gorge on only the finest soft candies in the world. However, I seriously doubt that a moment of this much gluttony is acceptable to the Church of England, or any other religious sect for that matter! But this blend was inspired by what is likely the most reverent and magnificent cathedral of the religion, Westminster Abbey (see image below). Just as the cathedral itself is a longstanding symbol or grace and salvation, this aromatic tobacco from Rattray’s gives satisfaction to the smokers with a sweet tooth–an indulgence that few other tobaccos have matched. While this may seem trivial to some of you, one of the most important components of this blend is the construction of the tin itself. Rattray’s has adopted the American tin style, one with a plastic snap on lid, but they have made it better–more secure. The result is a storage compartment that preserves the tobacco better for longer. But should it really surprise us that the Germans are impeccable engineers? Westminster Abbey is a pure aromatic. There are three, components that make up this tobacco: a loose cut Virginia, loose cut Burley, and a broken flake made from what seems to be even parts bright Virginia and Black Cavendish. The tobacco has a heavy cream and caramel topping, especially heavy, but somehow is not a swamp of syrup either. It is dryer than you would think for a blend with this much sweet flavor. The star is the tin note. As soon as your burst the cap, an avalanche of rich, velvety smooth caramel and cream rush into your nose, pleasuring it in an embarrassingly sinful manner. If I were a betting man, I would say that you will never smell the topping of a pipe tobacco as purely as you can Westminster Abbey. The Collegiate Church of St Peter at Westminster, London – “Westminster Abbey” at night. Do you remember that Willy Wonka movie from a few decades ago? If so, then do you remember the seen where the “plump” child is sucked into the tube of chocolate? Well I suspect that all the creamy sugary goodness that child tasted holds no straw to Westminster Abbey. This blend has so pure of a caramel flavor it is almost impossible to imagine. Here is where I begin to speculate. All that Rattray’s, or should I say Kohlhase, Kopp und Co. KG, for they blended the tobacco, claims was added to enhance flavor was caramel and cream. But I swear, and other smokers too, that the first couple draws of this tobacco clearly taste like some exotic fruit mixture. Perhaps it is just some strain of Virginia in my tin. Or maybe there is another ingredient to the topping they are not telling us. I don’t know. But it is definitely there! All this is good. However, their is another great thing about this blend: no bite. I smoked at least 10 bowls before writing this review. And as a smoker who is occasionally prone to bite, I can tell you that this is an undoubtedly gentle blend. The lovely note, or aroma if you prefer, is just as lovely as you would expect. Instead of setting the room ablaze with a cloud of sugar, the caramel cream flavor and gentle tobaccos used create some kind of velvet layer in the room. While it smells great (and trust me it does!) the magic is in the texture it emits. When you walk into a room of Westminster Abbey smoke, you won’t yell out “Caramel!” Instead you will be transfixed to a euphoric state of peace and relaxation. And just when you have calmed down enough, the sweet smell hits you. I have never had more trouble coming up with a drink or food to pair with a tobacco. No matter what I tried, the unique ideas sucked and the cliche tobacco pairings were just that, cliche. So instead of a usual parallel pair, one designed to be enjoyed while smoking, I will make a suggestion for the immediate post smoke. I think drinking a small glass of white milk is great. The cream will handle the sugar flavor well and all the fat will assist in neutralizing unnecessary gunk from the smoke. In this case I am in stark disagreement with the tobacco producers. That’s right, I think they are wrong. And I may be. That is why I would love to hear your opinion on this issue. 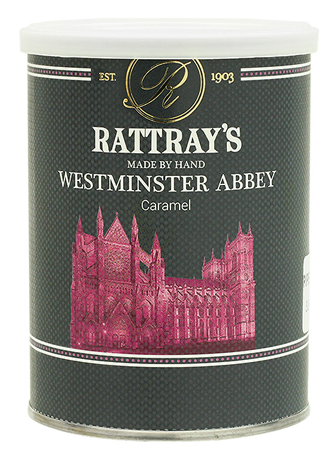 On the side of the tin, Rattray’s gives Westminster Abbey a medium bodied strength. I think that is ridiculous. This is a mild blend. I wouldn’t be upset if you called this mixture a mild/medium mix, but there is no way that its strength is medium. So I have not said many bad things about this blend. The reason why is simple: there are not a lot of issues. But, I will not be giving this blend a high score. The reason is because this blend has no high ambition. While it tastes like what it was supposed to, it isn’t a grand blend. It is too safe. There is nothing about this blend that screams tobacco. Don’t get me wrong, it has a ton of flavor, but that flavor was added. If you are looking for a safe blend, one that smokes well, exactly as advertised then Westminster Abbey is for you. However, if you are looking for an experience, something more, then this may not always be the right tobacco for you. I give Westminster Abbey a score of 5 out of 10. I know that seems harsh. It’s just the truth. While it is fun to smoke and I loved it, it leaves the smoker feeling empty, feeling like they missed out on the party. Images provided by CHRentals, TobaccoPipes.com, and Rattray’s. Rattray’s is another Tobacco brand I have no experience with, but want to try. Your description for this blend is very tempting, as I am a fan of caramel related products. I don’t think the score is too harsh, as people tend to forget 5 isn’t a bad score, just average. Based on your review, I think I’d pick up a different Rattray’s blend like Marlin Flake, and go with C&D’s Autumn Evening for my next aromatic. Still, this wouldn’t be a bad blend to have around when having a pipe around non-smokers. Good point. To me it doesn’t taste at all like autumn evening, but it does give you the same feel. I think other Rattray’s blends are better, so that should be a good choice. And yes, smells sublime!